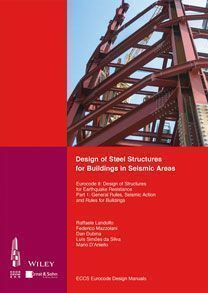 This volume elucidates the design criteria and principles for steel structures under seismic loads according to Eurocode 8-1. Worked Examples illustrate the application of the design rules. Two case studies serve as best-practice samples. Rafaelle Landolfo is Professor at the University of Naples, Institute of Contructional Engineering and Architecture. Federico Mazzolani is Emeritus Professor of Structural Engineering at the University of Naples. Dan Dubina is Professor at the Department of Steel Structures and Structural Mechanics, Politehnica University of Timisoara, Romania. Luís Simões da Silva is Professor of Structural Mechanics at the Department of Civil Engineering at the University of Coimbra, Portugal.